Barnett Newman is best known for the monumental paintings he began making in the late 1940s which incorporate unified fields of color that have been demarcated into zones by vertical, or occasionally, horizontal, stripes the artist called "zips." 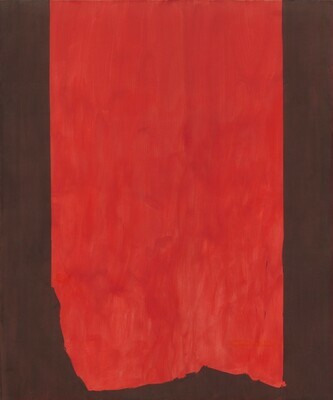 The zip was a compositional fulcrum, a source of movement, division, and measurement, as well as a carrier of often metaphysical meaning.Achilles presents an unusual composition for Newman, for the central element has been expanded from a zip to a broad swath of brilliant red paint that sweeps down the canvas and ends in an irregular, jagged edge. The exterior straight-edged bands of blackish-brown color, which Newman painted after the red, are for the most part uniform and deeply opaque. In contrast, the red is sensuously modulated, having been deftly applied with broad sweeps of the brush that permit the white priming to remain visible throughout. Intensely radiant, the hot red tonality contrasts sharply with the dark perimeter and seems to advance optically. It was not unusual for Newman to use titles from the Bible or Greek mythology. He likened the "red and fiery" shape in Achilles to a shield, presumably referring to the armor made for the hero of Homer's Iliad in the volcanic workshop of Hephaestus, the patron of metallurgy and god of fire. Annalee Newman; gift 1988 to NGA. Barnett Newman, Museum of Modern Art, New York; Stedelijk Museum, Amsterdam; Tate Gallery, London; Grand Palais, Paris, 1971-1972, no. 37 (New York catalogue), no. 31 (European catalogues), repro. in European catalogues. American Abstract Expressionists, Edinburgh International Festival, 1981, no. 30, repro. Art for the Nation: Gifts in Honor of the 50th Anniversary of the National Gallery of Art, National Gallery of Art, Washington, D.C., 1991, 398-399, color repro. Abstraction in the Twentieth Century: Total Risk, Freedom, Discipline, Solomon R. Guggenheim Museum, New York, 1996, no. 127, repro. Barnett Newman: Bilder - Skulpturen - Graphik, Kunstsammlung Nordrhein-Westfalen, Düsseldorf, 1997, no. 10, fig. 53. Barnett Newman, Philadelphia Museum of Art; Tate Modern, London, 2002-2003, pl. 55. Declaring Space: Lucio Fontana, Yves Klein, Barnett Newman, Mark Rothko, Modern Art Museum of Fort Worth, 2007-2008, unnumbered catalogue, repro. American Paintings: An Illustrated Catalogue. National Gallery of Art, Washington, 1992: 243, repro. National Gallery of Art, Washington. National Gallery of Art, Washington, 1992: 267, repro. Zweite, Armin. Barnett Newman: Bilder, Skulpturen, Graphik, Exh. cat. Kunstsammlung Nordrhein - Westfalen Düsseldorf, 1997, no. 53, repro.